Homeowners make significant investments redesigning their outdoor spaces, so it comes as no surprise that one of the biggest trends in Johns Creek real estate is the addition of koi ponds and outdoor fountains. From patios to backyards and front yards, there’s no better way to transform these areas than with a custom water feature. At Universal Aquatics, our team of industry-approved specialists will help you craft the outdoor space of your dreams. With more than 15 years of experience in the Johns Creek area, our team of design specialists understands all aspects of pond installation: how mechanical parts like pumps and filters interact with biological elements like fish and plants. Most importantly, we work to maximize aesthetic pleasure while still keeping your project within budget. Are you interested in installing a new koi pond, decorative waterfall or fountain? Need a repair consultation? Call Universal Aquatics today at (404) 680-2150 to speak with an expert. Have you spoken with neighbors or friends that own koi ponds? Our technicians often hear how simple water fixtures can easily turn into maintenance nightmares for some homeowners. From faulty filtration systems to major leaks, our specialists have seen and repaired it all, though we are always complimented to hear customers say, “I should have called Universal Aquatics first.” Our team is more than just the most experienced and trusted name in Johns Creek. We provide a low-maintenance guarantee so that you can rest assured your new outdoor investment will be a pleasure to look at and a breeze to maintain. Why and how is Universal Aquatics different? • Our team is a Certified Aquascape Contractor (CAC), meaning that our designs have been examined to meet industry standards in quality and durability. • We only use high-quality parts and equipment. From filters to pond liners, this means that you will run into fewer unexpected maintenance problems. • Encounter a problem with your unit? After installation, our team offers years of consultative ownership advice and support. • Only one Atlanta pond team has been featured in the 2016 Water Garden Expo, Pond Trade Magazine, and Nat Geo Wild’s Pond Stars. That team is Universal Aquatics. 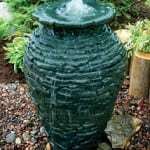 What kind of outdoor water feature are you interested in? From the most popular decorative waterfalls to custom-made waterfalls, our team offers a wide range of installation and design services. Koi ponds, illuminated fountains, golf course fountains, and other commercial designs are popular throughout the Johns Creek area. We also provide retention pond liner installation, pond cleaning services, and other hassle-free maintenance programs. Call us today to learn more.